Last week, a Manhattan Beach family was the victim of a horrendous crime: a burning tire filled with gasoline was thrown at the front door of their home in the early morning hours. After picking up her mother – who needs the help of an oxygen tank to breathe – Betsy realized that she had left behind a critical piece of her mother’s oxygen tank: the nosepiece. Yesterday morning, the DeKalb County Police Department officially kicked off a partnership with Nextdoor. Covering the greater Atlanta area, the Department will now be able to work directly with residents to improve safety and strengthen neighborhood watch efforts. Nextdoor’s Robbie Turner was in town to speak alongside Interim Police Chief James Conroy at a press conference. “Nextdoor makes it easy for neighbors to establish virtual neighborhood watch and help combat crime,” said Chief Conroy. This partnership with the DeKalb County Police Department marks the largest agency to partner with Nextdoor in the state. 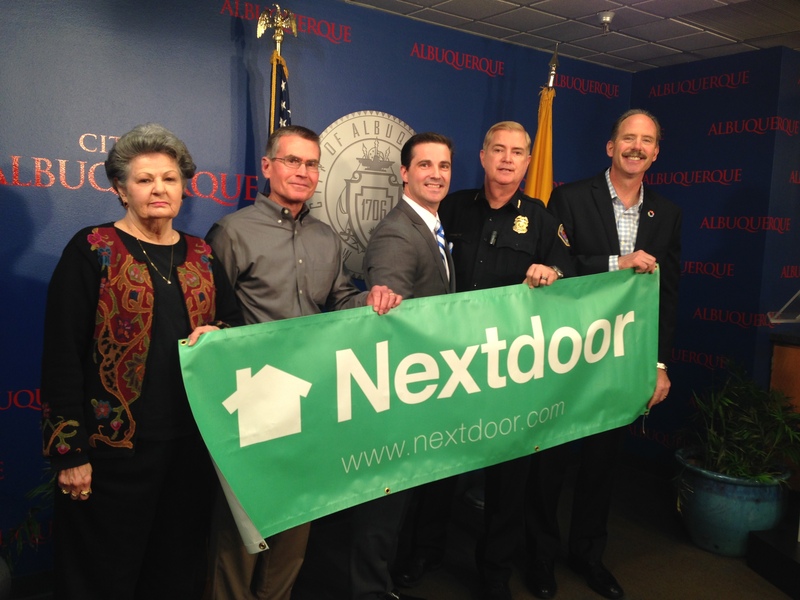 Out west, the Albuquerque Police Department and Mayor’s Office took their crime-fighting efforts high-tech and announced a partnership with Nextdoor. Led by Albuquerque Police Chief Gorden Eden, Jr., the Department and the Mayor’s Office plan to use Nextdoor to communicate directly with neighbors and provide information that is specific to their neighborhoods. “Nextdoor is a great opportunity – for free – for people to sign up as a neighborhood, to come together as a city, neighborhood-by-neighborhood, block-by-block,” said Mayor Richard Berry. Chief Eden shared a recent example of how Albuquerque residents have been leaving their cars unattended while warming them up in the mornings, which has led to an increase in stolen vehicles. Eden said the Department can now use Nextdoor to warn neighbors of issues like these. Interested in connecting with your local government on Nextdoor? Contact us here. Nextdoor Partners with the Emerald City and Celebrates One Year with St. Louis! The Nextdoor team is excited to welcome a new partner to the Nextdoor neighborhood and celebrate the anniversary of another successful partnership! On Wednesday, Nextdoor’s Director of Partnerships, Jeremie Beebe, was in Seattle to kick-off our partnership with the City of Seattle and the Seattle Police Department. In a city where more than 97% of the neighborhoods are already using Nextdoor, the partnership with the City and the Police Department will enable residents to communicate directly with their city officials. The police department plans to use Nextdoor to share everything from crime trends and blotter articles to community policing microplans. Welcome to the neighborhood, Seattle! We also celebrated the one year anniversary of our partnership with the City of St. Louis this week! 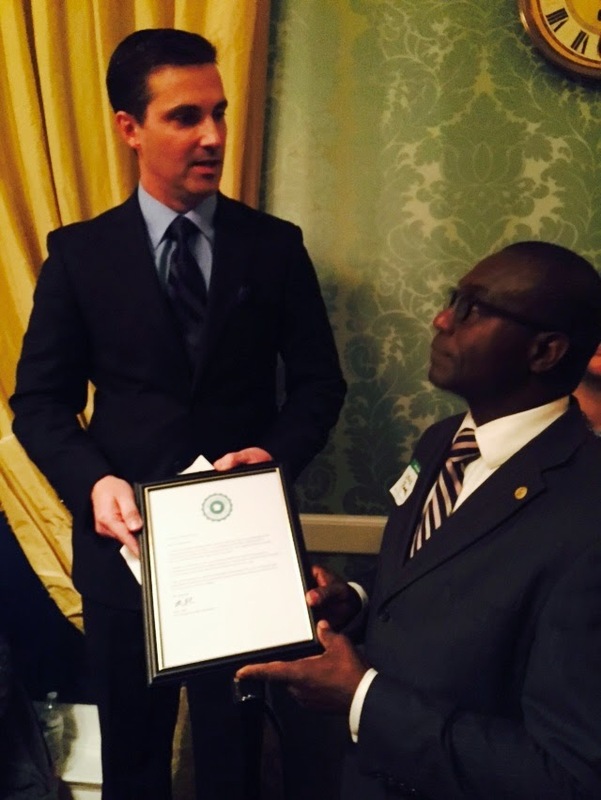 To commemorate last year’s launch, St. Louis President of the Board of Aldermen Lewis Reed held an awards ceremony to recognize St. Louis neighborhoods, ‘Nextdoor Heroes,’ and city employees for their outstanding commitment to building stronger and safer neighborhoods with the help of Nextdoor. The event was held at the historic Cabanne House in Forest Park and more than 100 Nextdoor St. Louis members were in attendance to accept awards and show their appreciation for their neighbors, the City, and Nextdoor. Jeremie attended the event to share in the celebration and discuss the success of the partnership. Over the past year, there has been a 160 percent increase in membership, participation amongst St. Louis residents has nearly tripled, and content contribution has nearly doubled. The City has actively shared more than 1,500 informative posts and updates with members. President Reed and Jeremie recognized more than 40 neighborhoods, ‘Nextdoor Heroes,’ and city employees during the event. Jeremie also presented President Reed with a letter of recognition from Nextdoor’s Co-Founder and CEO, Nirav Tolia, commending him for all he has done to help bring Nextdoor to neighborhoods across St. Louis. We are honored to have been a part of such a wonderful evening that highlighted the amazing things that can happen when communities combine the power of technology with the power of connected neighbors. We are grateful to President Reed and the City of St. Louis for the opportunity to play a small role in helping make St. Louis an even better place to call home. We look forward to all that is to come for Nextdoor in both St. Louis and Seattle! National Good Neighbor Day is taking place on Sunday, September 28! In the spirit of the holiday, we hope you will take some time to celebrate in a neighborly way. Big or small, the effort you make this September can have a lasting impact on your entire neighborhood. After all, studies show that neighbors who know each other look out for each other – and neighbors who look out for each other help make their neighborhoods stronger and safer. Say hello! Smile and wave at the neighbors who walk or drive by your home. Make a point to introduce yourself to the neighbor who just moved in. Pretty flowers growing in your yard? Make a small bouquet to give to your neighbor. Bake a batch of cookies and deliver a plate of them to your neighbor. Everyone loves a cool glass of lemonade. Help the kids with a lemonade stand! Does the neighborhood entrance or local park need some TLC? Organize a cleanup. Take the opportunity to learn about emergency preparedness. Does your neighborhood have a plan in the event of a fire or natural disaster? Host or help coordinate a BBQ, potluck, pancake breakfast, pizza party, or cookie exchange. Have or know a neighbor with a projector? Plan an outdoor movie night. 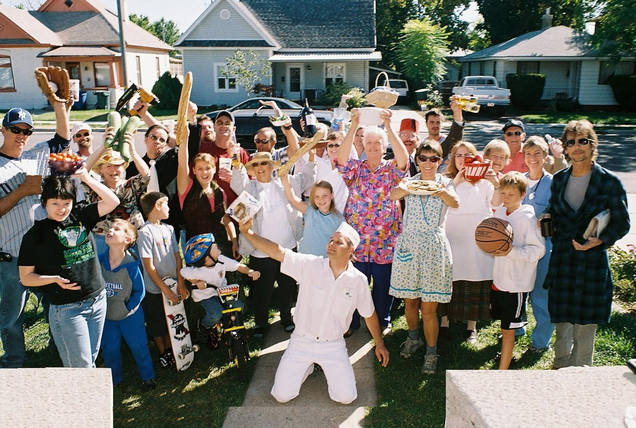 Plan a neighborhood-wide yard or garage sale. No matter what you do to celebrate National Good Neighbor Day in your community, we hope it helps you connect with your neighbors and helps to build an even better place to call home. Nextdoor Co-Founder Sarah Leary celebrates the announcement with Fire Chief William McDonald, Mayor Carolyn G. Goodman, and Police Captain Shawn Andersen. We are excited to officially welcome the City of Las Vegas to the Nextdoor neighborhood! 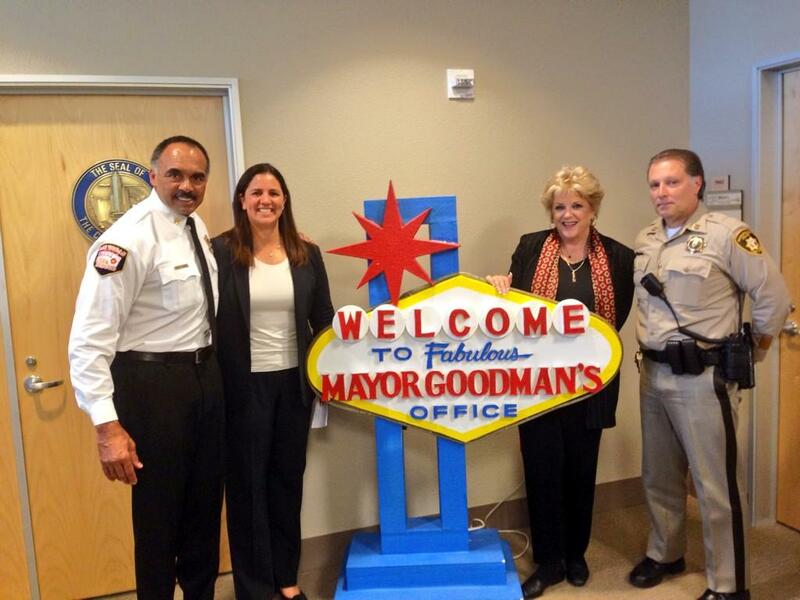 Yesterday, our Co-Founder, Sarah Leary, visited Las Vegas to join Mayor Carolyn G. Goodman, Fire Chief William McDonald and Police Captain Shawn Andersen to announce a partnership between Nextdoor and the City of Las Vegas. The partnership will enable city agencies to send targeted information to Las Vegas residents who join Nextdoor. More than 110 neighborhoods, representing 60 percent of the city of Las Vegas, have already launched Nextdoor websites. Residents can now expect to receive updates from the the City of Las Vegas, Las Vegas Fire & Rescue, and the Las Vegas Metropolitan Police Department. To join or start your own Nextdoor website, click here. This week we celebrated the one year anniversary of our partnership with the Sacramento Police Department! Nextdoor’s Head of Communications, Kelsey Grady, headed to Sacramento to celebrate the anniversary alongside Sacramento Police Chief Samuel Somers, Jr.
Police Chief Samuel Somers, Jr. speaks in front of the Habitat for Humanity build, where several Sacramento Police Department officers have volunteered their time. Just over a year ago, the Sacramento Police Department adopted Nextdoor as one of several tools used to improve neighbor-to-neighbor communications as well as increase participation in Neighborhood Watch across the city. The Department set a goal to grow membership to 10,000 residents during its first year, which it reached ahead of schedule in just five months! Since last June, the number of Sacramento residents using Nextdoor has increased 432%, and 86% of the neighborhoods in Sacramento have launched Nextdoor websites. Chief Somers emphasized that Nextdoor has been an integral part of the Department’s strategy to make Sacramento the safest big city in California. He said crime was down 10% last year, had fallen another 15% this year, and their Neighborhood Watch program had grown by 50%. He credited resident engagement and Nextdoor for providing tools to help neighbors connect with each other and the police. As a result, today the Department set a new goal to grow Nextdoor membership to 50,000 in the year ahead. We are grateful for the opportunity to work together with the Sacramento Police Department to help make Sacramento an even better place to call home. 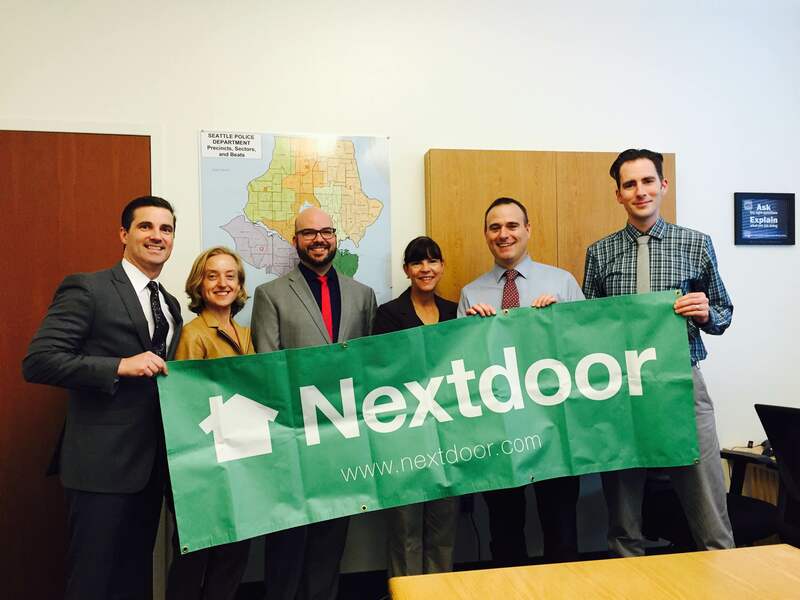 We look forward to the upcoming year and welcoming even more Sacramento neighbors to Nextdoor! You can join or start your Nextdoor website here. If you are a member with a story about how you and your neighbors have used Nextdoor, contact us here. If you are a reporter writing a story about Nextdoor, please contact us here. If you are interested in connecting with your local government on Nextdoor, please click here.